Lunn, Nicholas J.. "Polar Bear". The Canadian Encyclopedia, 07 September 2018, Historica Canada. 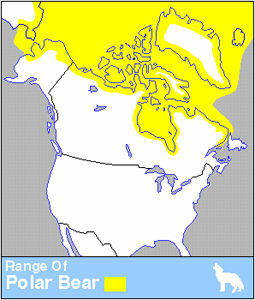 https://www.thecanadianencyclopedia.ca/en/article/polar-bear. Accessed 26 April 2019. 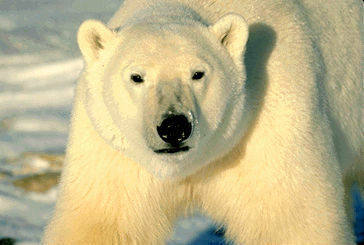 The polar bear is the largest living species of bear. 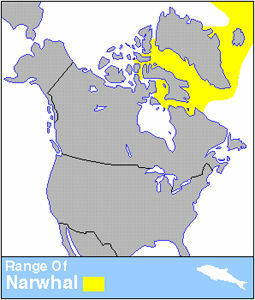 They are found in the northern reaches of Canada, including parts of the Yukon, the Northwest Territories, Nunavut, Manitoba, Ontario, Québec and Newfoundland and Labrador. 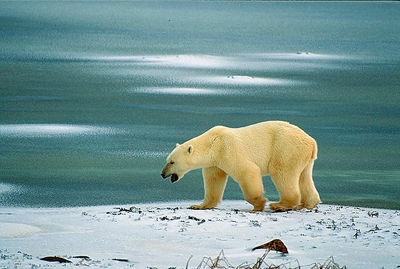 The polar bear (Ursus maritimus) is a large carnivore with white fur and black skin. 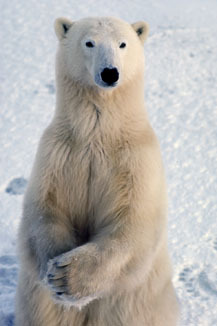 On average, the polar bear is the largest of the eight living species of bears. Adult males are typically 2.4–2.6 m in length and weigh 400–600 kg; adult females are about half the size (1.9–2.1 m, 200–300 kg). Polar bears are found on the ice-covered waters of the circumpolar Arctic. They prefer areas of annual ice that occur over the shallower waters of the continental shelf, which are more biologically productive than deeper waters of the polar basin. There are an estimated 20,000 to 25,000 polar bears worldwide, about 64 to 80 per cent of which are found in Canada — in the Yukon, Northwest Territories and Nunavut, as well as northern portions of Manitoba, Ontario, Québec and Newfoundland and Labrador . 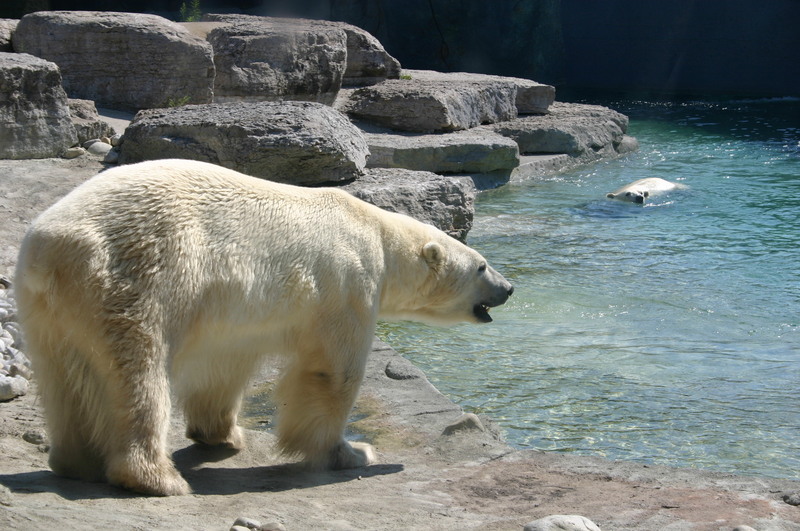 Polar bears feed primarily on ringed seals and, to a lesser degree, bearded seals. They will also kill harbour seals, harp seals, hooded seals, and occasionally walrus	and beluga whales. Polar bears catch seals when they surface at breathing holes, by stalking basking seals on the sea ice, and by breaking into the birth lairs of ringed seals. 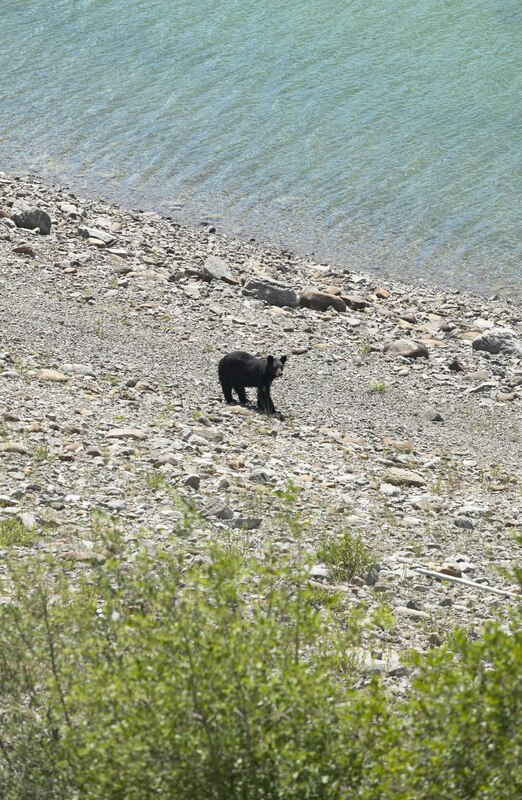 In areas such as Hudson Bay, the sea ice melts completely each summer, forcing bears in the area to come ashore and wait for the ice to reform. 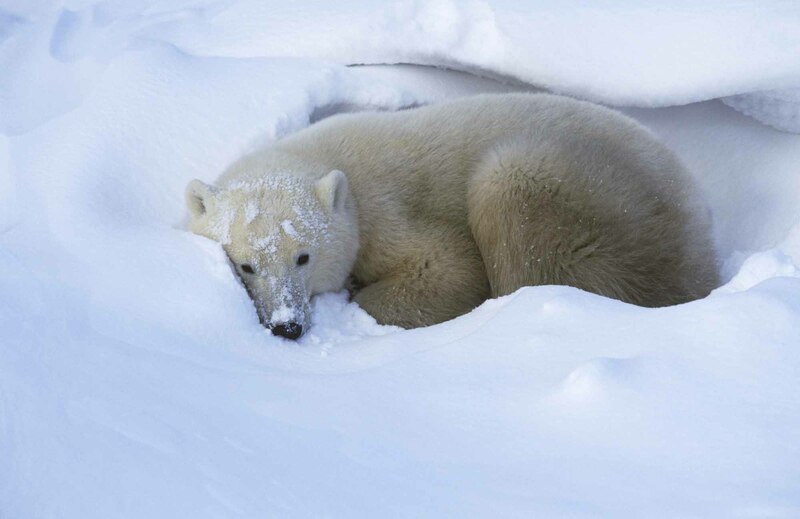 While onshore, polar bears use their fat stores to meet energetic needs. Although some polar bears will eat berries, grasses and other food items while onshore, it is thought that these do not provide significant nutritional benefit. Polar bears are sexually mature at four or five years of age. Mating occurs out on the sea ice in April and May. The fertilized egg does not implant until mid-September to mid-October. Cubs are typically born in snow dens on land from late November to early January and weigh less than 1 kg. 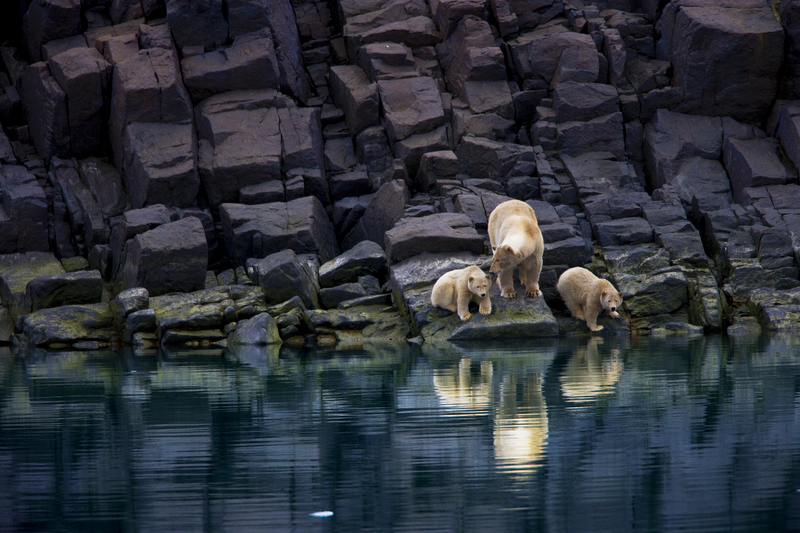 Depending on location, mothers and cubs leave these dens in late February to late April and return to the sea ice. A litter size of one or two cubs is normal; triplets are rare. Cubs are weaned at approximately 2.5 years of age. 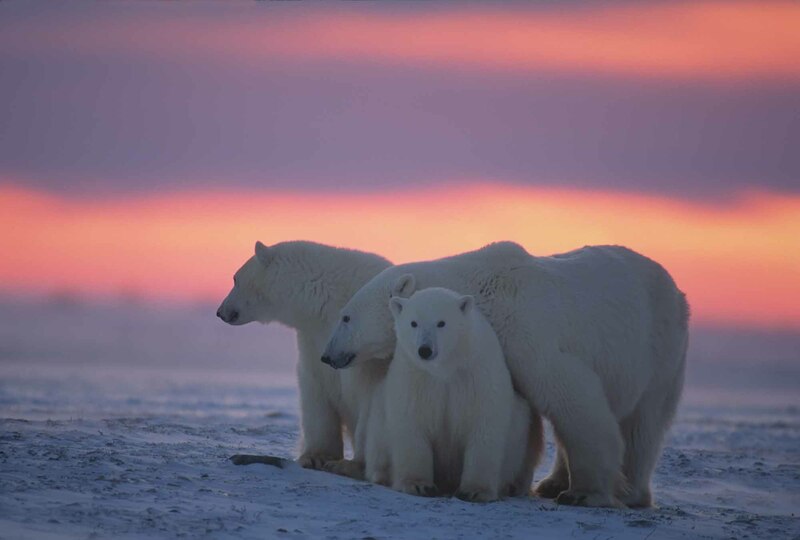 Polar bears have high cultural and economic importance to the Inuit. 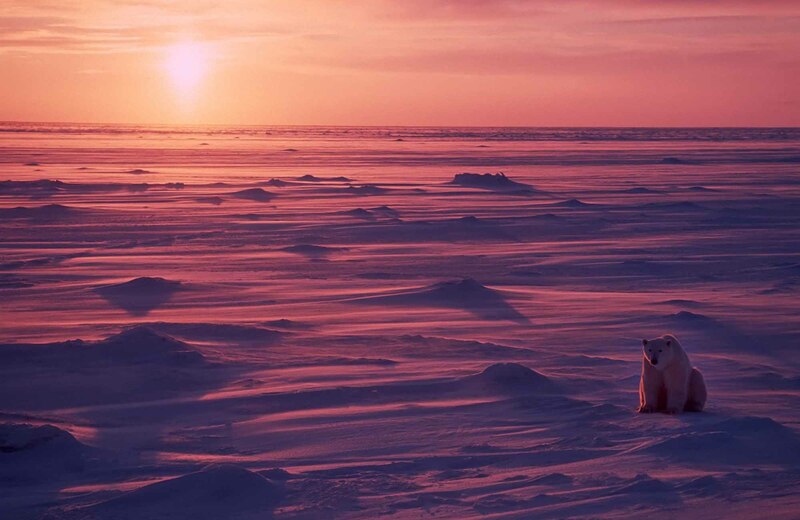 Subsistence hunts are carried out by Inuit communities, and their harvests are based on a government-regulated quota system. The conservation of polar bears is guided by the 1973 Agreement on the Conservation of Polar Bears, which was signed by all five polar bear nations — Canada, Denmark, Norway, United States and the former USSR (now Russia). Internationally, the polar bear is listed as "vulnerable" on the International Union for Conservation of Nature (IUCN) Red List of Threatened Species. The Committee on the Status of Endangered Wildlife in Canada	lists the polar bear in Canada as a species of "special concern" (see Endangered Animals). Historically, the Arctic marine ecosystem was assumed to be relatively stable and predictable over the long-term. However, the Arctic is warming, annual and multi-year sea ice cover is declining, and sea ice thickness is decreasing as a consequence of climate change. The polar bear is a highly specialized species dependent on sea ice and is therefore particularly vulnerable to alteration of its environment. Changes in sea ice are already known to have resulted in decreased numbers and productivity of some subpopulations of polar bears. Loss of sea ice habitat is the most critical conservation concern for polar bears. Persistent organic pollutants (POPs) are also of concern. These chemical substances are products of human industrial activity and do not easily break down by natural processes. If released into the environment, POPs can travel great distances by air and water from where they were produced. They tend to accumulate in polar regions, such as the Arctic, where they are readily stored in the fatty tissues of animals. Although the effects on polar bears are only partially understood, levels in some polar bear subpopulations are already sufficiently high that they may interfere with hormone regulation, immune system function and possibly reproduction. 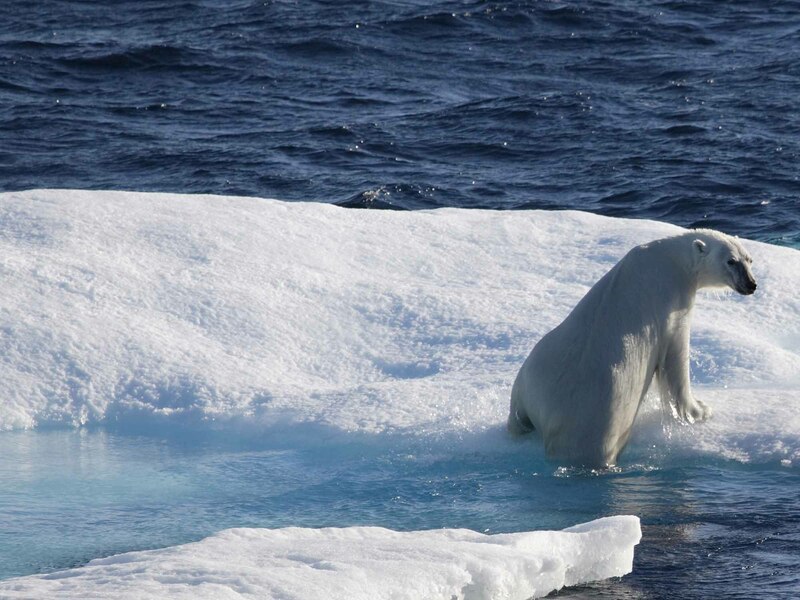 Additional potential threats to polar bears include oil exploration and development (such as in the Beaufort Sea), other resource exploration, increased development, icebreaking and shipping. In general, knowledge about the potential effects of these activities on polar bear subpopulations is lacking. 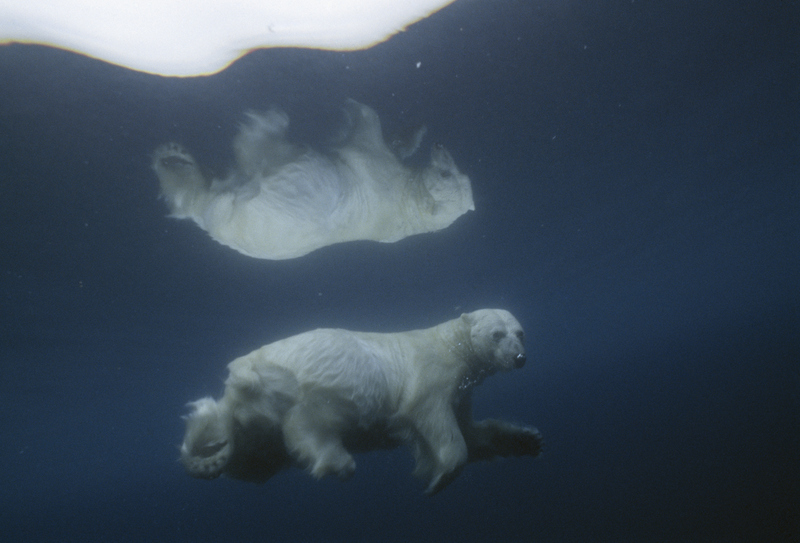 Andrew E. Derocher and Wayne Lynch, Polar Bears: A Complete Guide to Their Biology and Behavior (2012). COSEWIC DatabaseThe Committee on the Status of Endangered Wildlife in Canada (COSEWIC) determines the national status of wild Canadian species, subspecies, varieties or other designatable units that are suspected of being at risk of extinction or extirpation. Ours blancFiche d'information sur l'ours blanc, tirée du site Faune et flore du pays. COSEPACLe Comité sur la situation des espèces en péril au Canada (COSEPAC) détermine le statut national des espèces, des sous-espèces, des variétés ou dautres unités désignables sauvages du Canada que l'on présume en danger de disparition du pays ou de la planète. Polar BearSee a description of the natural history and typical habitat of the polar bear in Canada. From the "Hinterland Who's Who" website. Also includes video clips, summaries of related conservation issues, and educational resources.